How did your tea shop TeaFountain get started? 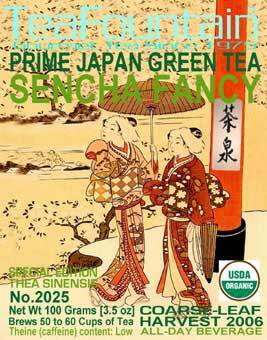 We started our tea business 33 years ago out of passion and curiosity about the health benefits of the Thea sinensis. Our physical location as well as the on-line order fulfillment place is in the San Francisco Bay Area. For over 3 decades we design our own tea line and import only decadent and prime-grade teas and tisanes from around the world. To get a feel and taste for our selection you might want to try TeaFountain # 1770 Flavored Green Tea JAPANESE CHERRY BLOSSOM. A few of the flavored white and green teas as well as our special Earl Grey blends are top-sellers. If you have the time take a moment and check and compare some of the 300 selections on our site TeaFountain.com and take advantage of the 'learn easy & fast' educational pages about tea.